Free fast lossless video codec designed for video capture. Each frame is compressed separately. Frame is divided into square blocks 4x4 or 8x4 pixels. Every block converted from RGB to YUV color space. Enumerative coding is applied to transformed block. It seems that algorithm can be easily implemented in hardware. 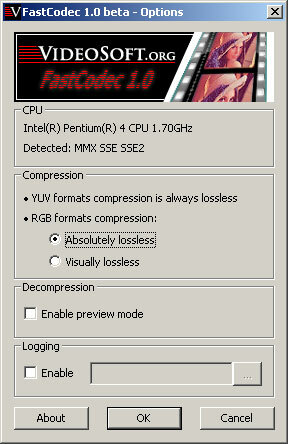 Compression and decompression operations requires low amount of memory - only for one image block. Frame size restrictions. Lossless compression requires that frame width and height must be a multiple of 4. Lossy compression requires that frame height is multiple of 4 but frame width is multiple of 8. Supported input and output formats: YUY2/YUNV/V422/YUYV, YVYU, UYVY/Y422/UYNV, RGB24, RGB32.